We couldn't resist taking an extra day to explore the rugged Catlins district of New Zealand. Falls in the Catlins, New Zealand. We made our way back to the Fossil Forest in Curio Bay and enjoyed foraging along the rock plateau searching for suitable tree fossils, tidal pool creatures, and bright coloured kelp to photograph. Driving on, we couldn't resist a peek at the Niagara Falls of New Zealand just to compare them with the North American namesake. It gives a little insight into the southern kiwi humour - because the falls are a mere trickle over the rocks in a small creek. Moving on from that great excitement, we take in the sights of the beautiful Catlins coastline during our travels with several viewpoints including Florence Hill with spectacular views over Tautuku Bay and Beach. 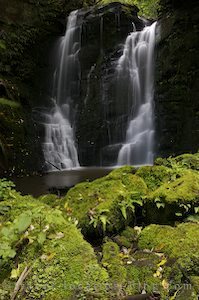 We had decided to stay an extra day in the Catlins to give us enough time to explore all the waterfalls and highlights we missed the last time. Our next stop was at Matai Falls, which are reached after an easy 10 minute walk through the bush from the carpark. Matai Falls stand at approximately 15 metres in height. A further 2 minute walk on the trail leads to another waterfall above Matai Falls, called Horseshoe Falls which stand at approximately 10 metres high. We decide to head back to Curio Bay to watch the penguins come ashore before leaving the Catlins area and moving on to the Central Otago district aptly named the fruit basket of New Zealand. We stayed at a wonderful campground with friendly hosts and great facilities at Miller's Flat.